The add-in version is currently 1.0 . Updates to this version fix errors generating single open end units, creates Revit materials for each color and can apply different colors to faces if they have been confiugred. Run the installation program by double-clicking the .msi file that was downloaded. The program will install the necessary files for all versions of Autodesk Revit which are installed on the destination workstation. Accept the license agreement to proceed and click next until the program completes the installation successfully. Launch Autodesk Revit and start a new, empty project. There are two ways to insert units directly into a project – drag a unit from the add-in directly to a plan or 3D view -or- right-click on a unit and choose “Add to Project”. When a unit is dropped into a view, it will wait for placement and continue until the command is canceled. This is identical to the way Revit functions when dragging a family type from the project browser. When a unit is added to the project, it does not start the insert command automatically. A unit instance can be placed using standard Revit functionality for inserting family types. The unit can be found in the 'Generic Models' category under Families (in the Project Browser pane). 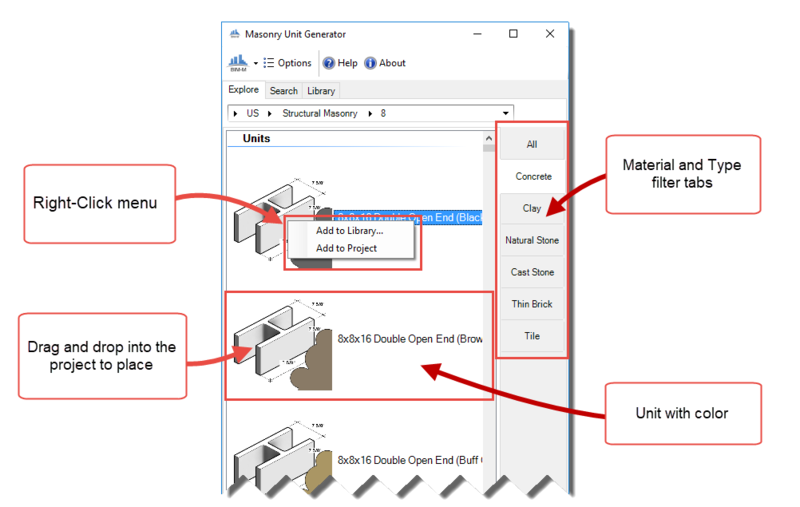 Masonry unit models can be generated and saved directly to folders on your workstation for distribution or use at a later time by choosing the “Add to Library...” item from a unit right-click menu. Configure your library location on the 'Library' tab of the tool. This is the default starting point where the add-in will store and list the masonry unit Revit families as the library is being built. Note: It is recommended to use the lowest version of Revit when building the library to ensure maximum compatibility. For example, if your office uses Revit 2016 and up on projects, use the add-in in 2016 to generate families for the library. The add-in does not permanently store family files in folders unless the “Add to Library...” function is used. On the Library tab, click the folder icon and browse to a directory where the masonry unit families will be saved. This will be the starting point whenever the tool is used to generate a family model file. The masonry units listed in the library can be used and loaded just as they can from the 'Explore' and 'Search' tabs. 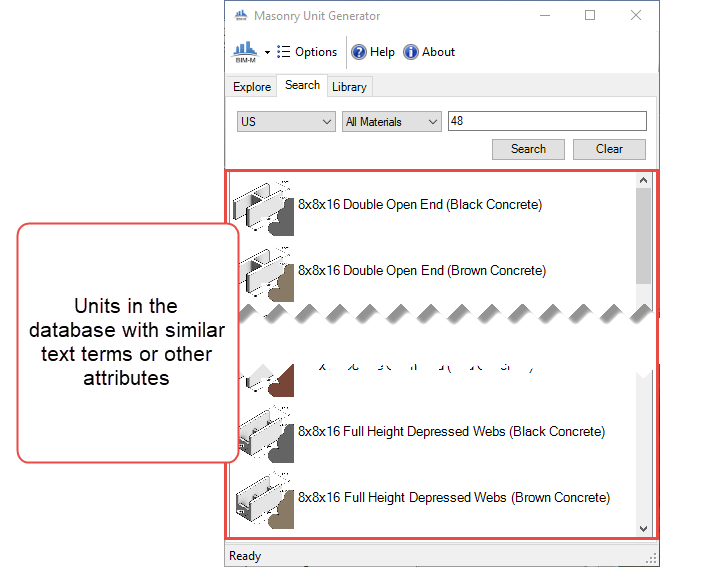 The MUD not only stores the instructions to generate CAD models of masonry units but also contains “meta” information to better organize and enhance searching. As the MUD continues to develop, more and more useful information will provide many ways to find the masonry units you seek. On the Search tab, there are several controls the aid in the filter/refinement of results. The easiest and most broad is the text box search. Simply type a term and click the search button. The add-in queries the database for matching terms, beginning with what was typed in the box. For example, typing double open end and clicking the search button will return all of the units whose name contains those words. 48 returns an 8x8x48 Lintel unit (and more as the database grows). A right-click on a result will present the usual options with one additional: “Find Similar Items”. This shortcut will attempt to locate additional results of units which may be related to the other such as by name, material, color, system type, etc. The two drop-down menus that contain filter terms for units of measure and all of the available materials. These can be used together to further refine the search results.